The choice of the potency of a homeopathic remedy has always been a subject of controversy. While looking for a natural law that could direct this choice, I stumbled upon the Fibonacci series that is present everywhere in the universe. By using those potencies in the correct order with the correct timing, a faster, deeper and more complete resolution of problems and cure of pathologies has been constantly obtained. The theoretical basis for using this system is presented here, followed by practical applications based on a series of real cases. Answers to many other questions that have plagued the homeopathic community are also answered, as a beneficial side-effect of this new system of prescription. This book details the use of the Fibonacci potencies in a busy practice over a period of three years. The author, Dr Joe Rozencwajg, is an experienced homeopath who has worked in Belgium, Israel, and South Africa and is currently based in New Zealand. He is well known by many homeopaths for his participaÂ­tion on various Internet discussion forums over the last 15 or so years. The author makes a very interesting case for choosing to work with what for most homeoÂ­paths would be an unconventional potency series. He read Michelle Shine's interesting book What about the Potency*which includes chapters from ten contemporary homeopaths on their use of potency. His opinion was that little consensus emerged about the use of potency with lots of different systems that seem to work for different homeopaths. Many homeopaths would just accept this as one of the idiosyncrasies of homeopathy. The author, though, questioned this acceptance and decided to look for a logical system of potency selection. He describes Kent's system of 6, 12, 30. 200. 1M. 10M as not following any logic and describes how the higher Korsokov-ian potencies are made differently from the Hahnemanman lower potencies. The French system 5, 7. 9. 15. 30 he again says shows no logic to it. This, along with the LM range, is all illustrated with a series of graphs. He describes the Fibonacci series in some detail. This series 1.1. 2, 3, 5, 8, 13, 21, 34, 55, 89, 144, 233 etc has the next number in the series formed by the addition of the previous two numbers The author illustrates how this exponential series is fundamentally important in the make-up of our universe from the quantum level to the make-up of galaxies. Examples of the series are given from all kingdoms - plant, animal, human body and mineral. A convincing argument is made for the Fibonacci series as one of the principle building blocks of the universe. This series given as potencies is to the author a more logical system than any system currently in use. It is hard to disagree with him; however, many homeopaths will point out the usage of their system or other tradional systems over many years with sometimes thousands of cases from many different homeopaths. The starting potencies were usually 3c; however sometimes it is 5c or 8c if the 3c or 5c weren't available. The author describes how he gave the potencies and then how he progressed from, for example, 3c to 5c to 8c to 13c to 21c to 34c and so on, along the series. He illustrates the use of this system with a number of cases, and claims that the potenÂ­cies support each other. I know that some homeopaths other than the author are using this system in the UK as well as in New Zealand. These are early days and I am not yet aware of any feedÂ­back' regarding their use. The author's website gives some extracts from the book and is well worth visiting. He does say that he expects a furious reacÂ­tion by some homeopaths to his book. I don't think that this will be the case. This, though, is another system that may well be tried by those looking to broaden their horizons with respect to potency use. However, most homeopaths are likely to pass it by, or to put it on hold for now until prominent teaching homeopaths start using and writing about it. It could be a slow burner without anyone getting furious. There is a chapter on potencies showing equivalent dilutions that requires more exÂ­planation, as I don't think that many will follow the thread. Although not officially a 'Dr' in New Zealand I think it only fair to refer to Joe Rozencwajg as a Doctor after all his medical training, medical practice and subsequent PhD qualifications. His position as Professor of Natural Medicine at Calmus International University could be questioned, though, as this establishment is not accredited as a University according to the Calmus website http://www.unicalamus. org/status.htm. In time, assuming others successfully use the system, then maybe this Fibonacci series system could be considered for a chapter in any second edition of Michelle Shine's book. 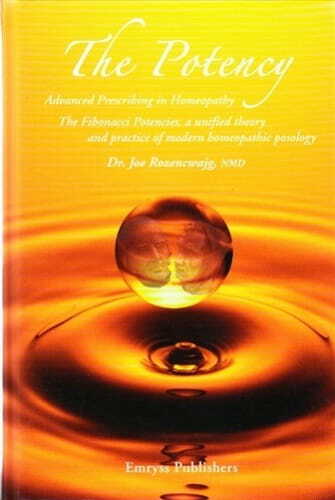 There is enough information in the book to introduce any homeopath to this method. The 3, 5, 8, 13, 21, 34 potencies should all be available at most pharmacies in the UK. The higher potencies may well be subject to an extra running up charge. Dr Rozencwajg's website is: www.naturamedica. webs.com. This book is an intriguing and compelling read: With charmingly colloquial yet eloÂ­quent language Dr. Rozencwajg revolutionÂ­ises all previous concepts of potency deciÂ­sion! Dr. Rozencwajg tells his journey to discovÂ­ering the healing powers of prescribing remedies according to the Fibonacci Series with honesty and humour - and obvious pride about his astonishing results. It is a very convincing story, and though the esÂ­sence of his arguments could be summarÂ­ised in a few words I would not want to deprive anybody from reading it for him or herself. The beautiful cover, pictures and design help to entice the reader, though I have to admit getting bored with "success stories" partway through the book. The idea of prescribing ascending potencies is obviously not new. The way in which Dr. Rozencwajg arrives at the Fibonacci Series as a basis, however, shows a determination for scientific understanding and desire for a harmonious concept as health is about harmony) that reminds one of a terrier with a bone. As a profession I feel we need to be grateful for people like him. For himÂ­self, Dr. Rozencwajg claims unashamedly that his discovery of the Fibonacci Series "is nothing else but a continuation of HahÂ­nemann's research for the perfect method of administration". Dr. Rozencwajg's enthusiasm is contagious and I am confident that the majority of readers will feel tempted to use his method, and so am 1. Enquiries with several homoeopathic pharmacies in the UK confirm Dr.Rozencwajg's suggestion though: You will need to make the potencies yourself (with a lot of elbow grease) or the expenses involved will be prohibitive.